When Pittsburgh City Council introduced the bill last week, it seemed too good to be true: the city finally had a plan, in writing, for replacing lead water lines on private property. For nearly a year, debates on whether or not the local water authority could replace privately owned pipes had been at the center of the city’s lead crisis. The state issued an order last summer for the authority to replace 7 percent of lead lines each year after test results came in above a federal safety standard for lead. But with the authority operating on the notion that it could only replace the public portion of the pipes, it made residents even more vulnerable to lead exposure. The process of partial pipe replacement can shake loose the remaining pipe’s lead, causing an increase in lead at the tap for weeks or months after construction ends. The Pittsburgh Water and Sewer Authority suspended the practice of partial line replacement earlier this month. When it announced the change, it said it had completed 49 partial pipe replacements in the one month the practice was in place. Four out of eight locations tested showed lead levels above the Environmental Protection Agency’s “action level” of 15 ppb (parts per billion) after the work was done, but the agency did not release lead levels from before the replacement. Until recently, local officials said they had no other choice. The authority had to obey the state order to replace lead lines, while another state law prohibited them from replacing privately owned lead pipes. "There’s no about-face here. The PWSA still has the opinion that it can’t go on private property and can’t replace privately-owned lead service lines. The city, which is not PWSA, can and is taking action to solve the problem." The proposed legislation, drafted by Mayor Bill Peduto’s staff and the city’s Law Department, outlines a legal maneuver that would allow Peduto and the director of Public Safety to serve as middlemen in an agreement for the PWSA to replace private lead water lines. Peduto chief of staff Kevin Acklin said PWSA would pay to replace a property owners’ line if both the public and private sides of it are lead; residents who have a lead line connected to a non-lead public line would have to pay for their own replacement. Officials are still discussing when the work would be done. So, rather than the PWSA striking agreements with property owners directly to replace their lead lines, the authority would instead make deals with the mayor and director of Public Safety who will make deals with individuals. The proposed bill cites the federal Lead and Copper Rule and the city’s Home Rule Charter and argues that the city has a responsibility to its citizens to get this work done. In city council, the bill will be up for discussion this week. A vote on it hasn’t been scheduled yet. How massive of a policy shift this would be for the city is difficult to overstate. Since Pittsburgh first began acknowledging its lead water crisis last summer, officials across the board, from PWSA to the mayor and his surrogates, argued vehemently that PWSA replacing lead lines on private property was squarely against state law. So what changed? Members of city council are wondering the same thing. “I’m not an attorney but I’ve been asking the same questions. For months. And now we’re getting new answers,” said Councilwoman Deb Gross, who represents several East End neighborhoods and serves on the PWSA board. Councilman Corey O’Connor had a similar reaction. According to Acklin, the bill is a “comprehensive” and “local” fix while the city continues to lobby Harrisburg to amend the Municipal Authorities Act, the state law in question. What changed, it seems, is how Peduto’s administration is choosing to approach the state law that governs the PWSA. At the center of the legal debates over lead line replacement is the Municipal Authorities Act, which sets guidelines for how organizations like the PWSA should operate in Pennsylvania. And one court case, known colloquially as “the Wettick opinion,” serves as the sole interpretation for a key subsection of that law. On the surface, those seem like reasonable guidelines. But they caused trouble for PWSA in 2011 when the plumbing company Dominion Products and Services sued it over an insurance program that it had set up for its customers. It worked like this: PWSA added a $5 fee to its customers’ monthly bills and put the money into a pot that could be used if a customer’s water or sewer lines broke or needed to be replaced. But the program was opt-out, meaning that everyone was automatically charged the fee unless you specifically told PWSA that you didn’t want to be part of the program. In court, Dominion and The Manchester Group, a utilities company, said the program hurt their businesses because PWSA was essentially offering to replace lines at a cheaper cost than they ever could. At the time, Judge R. Stanton Wettick agreed with the plumbers. In his opinion, he wrote that the opt-out insurance program wasn’t legal because it competed too heavily with companies that could also repair and replace water and sewer lines. To help prove his point, Wettick famously opened a phone book. 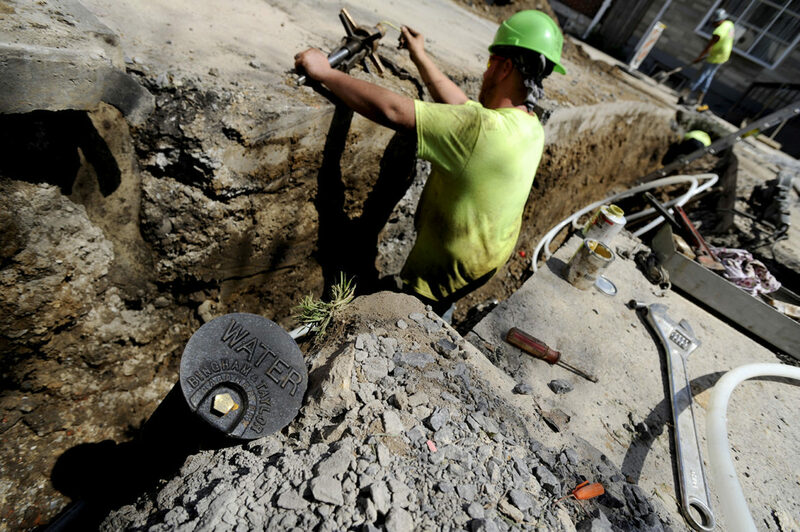 When it comes to replacing lead lines on residents’ private property, city officials have used this case to argue that PWSA cannot do the work and that its hands are tied. Acklin argued as much in a statement issued in March. While PWSA officials and the mayor had made similar arguments in public before, Acklin’s statement specifically cited Wettick’s opinion on how the Municipal Authorities Act should be interpreted. Mark Nowak, one of the attorneys who argued the Dominion case and still serves as a solicitor for PWSA, says much the same today. State lawmakers and legal experts, however, say that strict interpretation of the Municipal Authorities Act isn’t warranted and does not apply to the replacement of lead lines. Fontana’s bills would clarify what types of public money can be spent to repair and replace water and sewer lines but none of them directly amend the Municipal Authorities Act. All three bills have been in committee for a few months. "It doesn’t say they can do it, it doesn’t say they can’t do it. It doesn’t say anything at all." Pittsburgh’s lead problem is, of course, not unique. Other cities around the country, including Philadelphia, have had to grapple with aging water infrastructure and the potential health hazards it poses. But unlike Pittsburgh, those cities, including Lansing, Michigan and Madison, Wisconsin, didn’t have to grapple with restrictive municipal authority laws because the city, in each case, controlled the water system. Programs where a city replaces privately owned lead lines at the same time as it replaces water mains on the same block are common. But, as some lawyers like to say, bad facts make bad laws. That’s how Brad Korinski, the solicitor for Allegheny County Controller Chelsa Wagner, sees Wettick’s interpretation of the Municipal Authorities Act. Korinski said PWSA’s opt-out program was not legally sound to begin with so it resulted in a bad interpretation of the Municipal Authorities Act. In essence, Korinski said the Wettick opinion backs PWSA into a legal corner: Does it replace lead lines to protect its customers’ health and safety and risk another lawsuit, or does it avoid a lawsuit but potentially endanger its customers? Michael Witherel, a solicitor for the Municipal Authorities Association, said the law is just not clear on the matter. “It’s not like one takes precedence over the other, you have to read it as a whole,” he said. To further complicate matters, Wettick’s opinion is the only case law on the books for this particular section of the Municipal Authorities Act, leaving the PWSA relatively powerless unless it chooses to blaze a new path for itself. Gross has taken issue with that opinion. “There’s certainly a dissatisfaction among council members, myself included, that we accept that one legal interpretation [by Wettick], especially when it’s not very clear,” she said. "There’s certainly a dissatisfaction among council members, myself included, that we accept that one legal interpretation." Gross, like others on council, sees the city’s legal magic to avoid the Municipal Authorities Act as a good thing, but questions whether it will hold up in court if someone decides to sue PWSA or the city. According to Acklin, the bill was the result of months of discussions with both state and local officials. He said a team from the mayor’s office met with staff from Gov. Tom Wolf’s office, state legislators, including House Speaker Mike Turzai, officials from the Environmental Protection Agency, the PWSA board of directors and the city’s Law Department. In Peduto’s recent trips to Harrisburg, he has focused on this temporary fix as well as lobbying state lawmakers for permanent changes. PWSA spokesman Will Pickering said the authority was “generally supportive” of the proposal and that the board was still looking into its final details. According to interviews with several members of city council, some said they did not see the new lead line replacement bill coming. In the weeks leading up to its introduction, the mayor’s office did not put out a statement about the legislation, though Acklin said the mayor’s office briefed city council staff about the bill prior to June 13, the day it was introduced to council. Gross, who works closely with Peduto’s administration on lead and other PWSA issues since she serves on the authority’s board, was also surprised to see the legislation. “I’m grateful for the new answers but I don’t know what’s been changed in the administration’s mind,” she said. Councilman Dan Gilman, who introduced the bill in council on Tuesday and is a close ally of Peduto, declined to comment on the legislation through an aide. The aide said Gilman was not involved in drafting the legislation. As of Wednesday, an aide to Council President Bruce Kraus said he was still reviewing the bill. Other members of council didn’t respond to requests for comment. According to O’Connor, Wednesday, the day when the legislation is up for discussion, will be critical for council members. Big questions like how the city will pay for the lead line replacements, how long replacements will take and whether or not the bill will hold up in court all need to be answered, he said. Already, O’Connor said he sees one potential lawsuit: What if a resident already paid to have their lead lines replaced because the city said it couldn’t do the work for them? To mitigate this potential problem, Acklin said the city is looking at crafting a program to reimburse residents who already paid to have their lead lines replaced. While the city has proposed a legal framework for replacing lead lines, the bill is far from becoming law. Over the next several weeks, city council members will discuss and debate the bill before voting on it. Then, it will need to establish the formal procedures for the city to make agreements with both property owners and the PWSA to facilitate replacing the privately-owned lead lines. In the meantime, PWSA has halted partial replacements, so it may be months still before the city begins to actively solve the lead pipe problem. And that’s not to mention, of course, the possibility of a lawsuit if the council does pass the bill. Witherel doesn’t see those types of lawsuits as bad things. You can reach J. Dale Shoemaker at 412-515-0069 or dale@publicsource.org. He’s on Twitter at @JDale_Shoemaker. On an annual basis, PublicSource provides transparency into spending on salaries and overtime of public employees for the City of Pittsburgh, Allegheny County and Pennsylvania. Gerald S. Dickinson, a law professor at the University of Pittsburgh, plans to challenge U.S. Representative Mike Doyle in 2020. Pittsburgh City Council members gave preliminary approval to three bills that would ban the use of assault weapons and some gun accessories and allow guns to be taken from a person when an extreme risk protection order is filed against them. Thank you for this comprehensive look into the issue. I hope the City, PWSA, and other governmental entities do not use shaky law as an excuse to dodge their responsibilities to the people. ALL the lead has to go. Yes, a huge enterprise, so all the more reason to spread the expense to the whole community through the general fund.